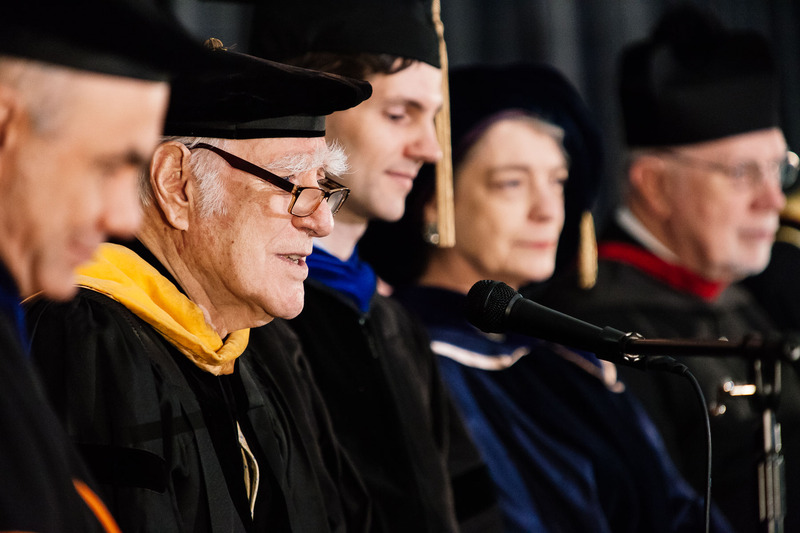 With fitting ceremony, on Monday, August 20, 2018, the community of Northeast Catholic College gathered to mark the beginning of the academic year with its annual Convocation. Each year this event offers the faculty and students the opportunity to gather together and reflect—through addresses by the faculty, prayers, and music—upon the high calling that unites the college’s journey through the academic year. Processing in academic regalia to the strains of “God of Our Fathers”—sung by the full college—the faculty assembled and the ceremony began with an invocation by the college’s chaplain, the Rev. Roger Boucher. The first address, offered by Dr. Mary Mumbach, considered how gratitude should mark our time together as teachers and students in community and common purpose, gratitude born from the recognition of how improbable it is that this group at this time and in this place might be allowed to pursue “the adventure of truth.” She reflected upon the ways in which “golden moments of insight” come into being within the classroom and linger at the edge of memory, and the ways in which the great books emerge from the tradition of classical liberal learning. The next day, the faculty assembled again, this time in the Our Lady, Queen of Apostles chapel for the Academic Mass of the Holy Spirit, celebrated by Rev. Matthew Mason, the Director of the Office of Vocations for the Diocese of Manchester (and former student of Dr. Sampo and Dr. Mumbach), Rev. Roger Boucher, the college’s own chaplain, and Rev. Theophan Leonarczyk, a member of the faculty and Chancellor of the Eparchy of Newton, Massachusetts. At this liturgy, following the homily, the members of the faculty publicly renewed their commitment to fidelity to the Church’s magisterial teaching.